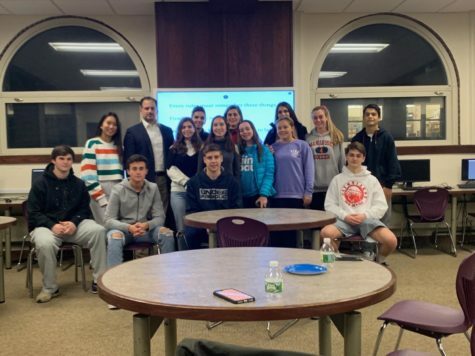 On Tuesday, December 5th, Manhasset High School students and their parents joined their high school’s Hellenic Culture (Greek) Club, led by myself (Gina Frankis) and Stelio Katopodis, in welcoming Nikolas Katsimpras to the community and hear him speak on today’s world’s most pressing issues. Nikolas Katsimpras is, along with many other things, a lecturer at Columbia University’s Negotiation and Conflict Resolution program and an assistant adjunct professor at the Dispute Resolution program at CUNY, John Jay College of Criminal Justice. He is an independent conflict analysis and resolution consultant and a former Senior Fellow at the Hellenic American Leadership Council. He is also a veteran officer of the Hellenic Navy, awarded by the International Institute for Humanitarian Law. With all of his insight, Mr. Katsimpras delivered an enlightening lecture that offered much insight as well as, ironically, a sense of reassurance regarding worldly, monumental problems. He discussed the complicated migration patterns of immigrants who have been using Greece as their gate of passage to other countries. Also, he spoke of his father’s experiences with armed conflict as well as his own, and the crisis between Greece and Turkey stemming from the close proximity of the two countries. Mr. Katsimpras used a presentation slideshow to give visuals and data relating to the discussion, and even incorporated classified footage demonstrating the extremely present threat of armed conflict between Greece and Turkey. Not only was he extremely informative on these types of facts, but he also instituted a life lesson that was strung throughout his presentation. He promoted the importance of recognizing the situations of others and taking them into account in everything one does and made it clear that, while it is okay to be proud, it is wrong to assume superiority over others simply because of differences in perspectives. Lastly, he taught that any type of leader, ranging from a coffee shop manager to a president, must always remember that his leadership title has an expiration date and that it is important to never abuse one’s power in the slightest, but rather treat people with respect and engage in civil discourse. Mr. Katsimpras’ presentation was, to say the least, very beneficial to mindsets of people, especially those of adolescents who are growing into the real world.